S. Bennett, R. Goubran, F. Knoefel. “Examining Changes in Image Segmented Arteries in Response to Blood Occlusion”. in Proc. of the IEEE International Symposium on Medical Measurements and Applications (MeMeA). Rochester, USA, May 8th, 2017. S. Bennett, F. Knoefel, R. Goubran. “Long Term Monitoring of a Pressure Ulcer Risk Patient Using Thermal Images”. in Proc. of the IEEE International Symposium on Medical Measurements and Application (MeMeA). Rochester, USA, May 8th, 2017. Wallace B, Knoefel F, Masson P, Goubran R, Baker A, Allard B, Stroulia E, Guana V Masson P. “Monitoring Cognitive Ability in Patients with Moderate Dementia Using a Modified “Whack-a-Mole.” in Proc. of the IEEE International Symposium on Medical Measurements and Applications (MeMeA). Rochester, USA, May 8th, 2017. S. Soleimani-Gilakjani, R. Goubran, H. Azimi, M. Bouchard, F. Knoefel. “Movement Detection with Adaptive Window Length for Unobtrusive bed-based Pressure-Sensor Array”. in Proc. of the IEEE International Symposium on Medical Measurements and Application (MeMeA). Rochester, USA, May 8th, 2017. N. Fung, B. Wallace, A. Chan, R. Goubran, F. Knoefel. “Distinguishing Healthy Older Drivers Using Acceleration and Driving Events”. in Proc. of the IEEE International Symposium on Medical Measurements and Applications (MeMeA). Rochester, USA, May 8th, 2017. H. Azimi, S. Soleimani-Gilakjani, M. Bouchard, R. Goubran, F. Knoefel. “Breathing Signal Combining for Respiration Rate estimation in Smart Beds”. in Proc. of the IEEE International Symposium on Medical Measurements and Applications (MeMeA). Rochester, USA, May 8th, 2017. A. McKee, R. Goubran, F. Knoefel. “Use of a cross-Correlation for Analysis of Trial-to-Trial Variability and related Signal enhancement of Event-Related Potentials from n-back Tests”. in Proc. of the IEEE International Symposium on Medical Measurements and Applications (MeMeA). Rochester, USA, May 8th, 2017. B. Wallace, R. Goubran, S. Marshall, M. Porter, A. Smith, F Knoefel. “Features that Distinguish Drivers: Big Data Analytics of Naturalistic Driving Data”. International Journal on Big Data. February 2017. B. Wallace, R. Goubran, M. Porter, A. Smith, F. Knoefel. “Unique Driver Behaviour- Machine Learning Classification to Differentiate Drivers”. Accident Analysis and Prevention. February 2017. R. Lopez Zunini, F.Knoefel, C. Lord, M. Breau, L. Sweet, R. Goubran, V. Taler. “Event-related potentials elicited during working memory are altered in mild cognitive impairment.” Int J Psychophysiol. Volume 109, November 2016, pages 1-8. F. Knoefel, B. Allard, V. Guana, B. Wallace, E. Stroulia, C. Gaudet, R. Goubran. “Monitoring Moderate Dementia with a Computer Game: The Western Ottawa Whack-a-Mole Pilot Study (poster).”Regional Geriatric Program of Eastern Ontario, Annual General Meeting, Ottawa, ON, October 28, 2016. F. Knoefel, S. Robichaud, M. Makramalla, M. Bilodeau, H. Sveistrup, T. Grant, J. Jutai, C. Gaudet, R. Goubran. “How much time do older adults spend in bed? (poster).” Canadian Association on Gerontology (CAG) Annual Scientific and Educational Meeting, Montreal, QC, October 20-22, 2016. F. Knoefel, S. Bennett, L. Carreau, A. Dewan, R. Goubran.“Can sensors help determine pressure ulcer risk? (poster).”Canadian Association on Gerontology I(CAG) Annual Scientific and Educational Meeting, Montreal, QC, October 20-22, 2016. B. Wallace, A. Puli, R. Goubran, F. Knoefel, S. Marshal, M. Porter, A. Smith. “Measurement of Distinguishing Features of Stable Cognitive and Physical Health of Older Drivers”. IEEE Transactions on Instrumentation and Measurement. February 2016; Volume 65, pp (99): 1-12. M. Cohen-McFarlane, J. Green, R. Goubran, F. Knoefel, “Smart Monitoring of Fluid Intake and Bladder Voiding using Pressure Sensitive Mats”, in Proc. 38th Annual International Conference of the IEEE Engineering in Medicine and Biology Society (EMBC 2016), Orlando, Florida, Aug. 2016. B. Wallace, R. Goubran, F. Knoefel, S. Marshall, M. Porter, A. Smith, “Driver Unique Acceleration Behaviours and Stability over Two Years” in Proc. IEEE International Congress on Big Data, San Francisco, United States, Jul. 2016, pp. 230-235. M. Cohen-MacFarlane, J. Green, R. Goubran, F.Knoefel.. “Characterizations of Measurements from Pressure Sensitive Mats using an Anthropomorphic Body Model”in Proc. of the IEEE International Instrumentation and Measurement Technology Conference (I2MTC), Taipei, Taiwan. May 23, 2016. M. Cohen-MacFarlane, J. Green, R. Goubran, F. Knoefel. “Monitoring Congestive Heart Failure Using Pressure-Sensitive Mats” in Proc. of the IEEE Annual International Symposium on Medical Measurements and Applications (MeMeA), Benevento, Italy. May 16, 2016. F. Knoefel, S. Bennett, L. Carreau, A. Dewan, R. Goubran. “Correlating nocturnal heel pressure to morning heel perfusion using sensors.” Canadian Geriatric Society (CGS) Annual Scientific Meeting, Vancouver, BC. April 17, 2016. F. Knoefel, S. Robichaud, M. Makramalla, M. Bilodeau, T. Grant, H. Sveistrup, J. Jutai, R. Goubran, C. Gaudet, “How Much Time do Older Adults Spend in Bed”, Gerontechnology International Journal, vol.15 (supplement), pp. 152s, Apr. 2016. V. Joshi, B. Wallace, A. Shaddy, F.Knoefel, C.Lord. “Metrics to Monitor Performance of Patients with Mild Cognitive Impairment using Computer Based Games” in Proc. of the International Conference on Biomedical and Health Informatics (BHI), Las Vegas, USA. pp. 521-524. February 24, 2016. S. Bennett, R. Goubran,F. 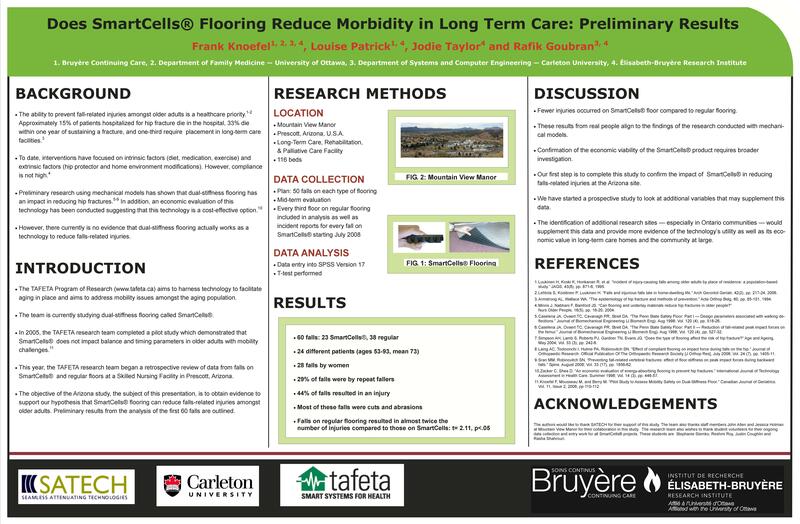 Knoefel, “Preventing Pressure Ulcers: Using Technology to Study Heel Immobility and Blood Flow (poster).” Ontario Centre for Learning, Research and Innovation in Long-Term Care (CLRI) Conference, Ottawa, ON., November 9-10, 2015. M. Cohen-MacFarlane, J. Green, F. Knoefel, R. Goubran. “Characterization of fibre optic pressure mats for long term patient monitoring (poster).” Bruyère Research Institute Poster Day, Ottawa, ON, September 24, 2015. S.Bennett, R. Goubran, F. Knoefel. 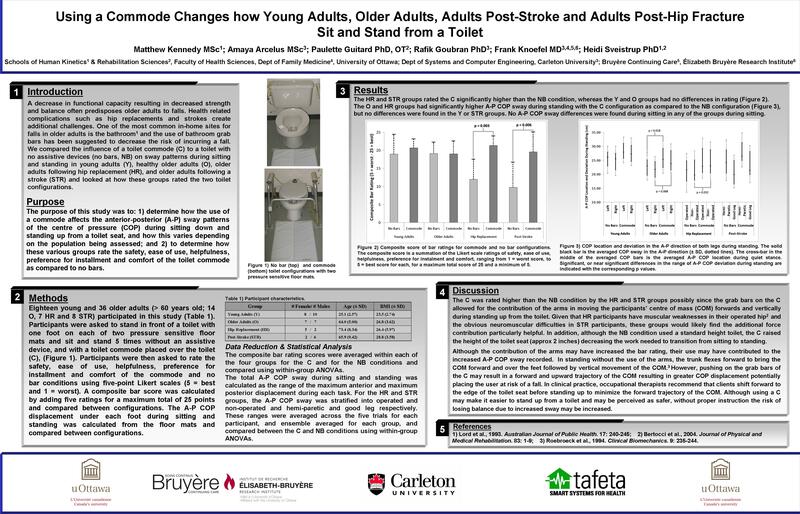 “Exploring the role of immobility and vascular changes in lower limb pressure ulcer development in CCC (poster).” Bruyère Research Institute Poster Day, Ottawa, ON, September 24, 2015. C. Morrison, F. Knoefel, R. Lopez Zunini, V. Taler, M. Breau, L. Sweet, C. Lord, B. Wallace, R. Goubran. “Does Cognitive Training Influence Verbal Recognition? (poster)” Bruyère Research Institute Poster Day, Ottawa, ON, September 24, 2015. S. Bennett, Z. Ren, R. Goubran, K. Rockwood, F. Knoefel, “In-Bed Mobility Monitoring Using Pressure Sensors,” IEEE Transactions on Instrumentation and Measurement, vol. 64, no. 8, pp. 2110-2120, Aug. 2015. F. Knoefel, R. Lopez Zunini, V. Taler, M. Breau, L. Sweet, C. Lord, B. Wallace, R. Goubran. “Comparing MCI Patients to Healthy Controls using Three ERP Paradigms.” EPIA Pre-Conference Meeting of the Alzheimer’s Association International Conference, Washington, DC, USA, July 18, 2015. M. Rockwood, B. Wallace, R. Goubran, F. Knoefel, S. Marshall. “Adaptive Drift Calibration of Accelerometers with Direct Velocity Measurements.” IEEE International Instrumentation and Measurement Technology Conference (I2MTC), Pisa, Italy, May 11-15, 2015. B. Wallace, A. Puli, R. Goubran, F. Knoefel, S. Marshall, M. Porter, A. Smith. “Big Data Analytics to Identify Deceleration Characteristics of an Older Driver. “ IEEE Symposium on Medical Measurements and Applications – MeMeA, Torino, Italy, May 7-9, 2015. B. Wallace, M. Rockwood, R. Goubran, J. Jutai. “Measurement of Vehicle Acceleration in Studies of Older Drivers from GPS Position and OBDII Velocity Sensors. “ IEEE Symposium on Medical Measurements and Applications – MeMeA, Torino, Italy, May 7-9, 2015. S. Bennett, R. Goubran, F. Knoefel, “Measurements of Change in Thermal Images due to Applied Pressure,” in Proc. IEEE International Symposium on Medical Measurements and Applications, Turin, Italy, May 2015, pp. 30-35. B. Wallace, R. Goubran, F. Knoefel, S. Marshall, M. Porter, M. Harlow, A. Puli. “Big Data Validation, Augmentation with k-Anonimity & Differential Privacy for Multi-year Driving Study. “ Carleton IBM Big Data Symposium, Ottawa, 2014. B. Wallace, A. Puli, R. Goubran, F. Knoefel, S. Marshall, M. Porter, A. Smith. “Big Data Analytics: Deceleration Characteristics of Older Drivers. “ Carleton IBM Big Data Symposium, Ottawa,ON, 2014. Z. Ren, T. Grant, R. Goubran, M. El-Tanany, F. Knoefel, H. Sveistrup, M. Bilodeau, J. Jutai. “Analyzing center of pressure progression during bed exits.” in Proc. 36th Annual International Conference of the IEEE Engineering in Medicine and Biology Society (EMBC 2014), Chicago, USA, Aug. 2014, pp. 1786-1789. M. Holtzman, R. Goubran, F. Knoefel. “Motion Monitoring in Palliative Care Using Unobtrusive Bed Sensors.” in proc. of 36th Annual International Conference of the IEEE Eng. in Medicine and Biology Society (EMBC 2014), Chicago, USA, August, 2014, pp.5760-5763. Z. Ren, T. Grant, R. Goubran, M. El-Tanany, F. Knoefel, H. Sveistrup, M. Bilodeau, J. Jutai. “Analyzing Center of Pressure Progression During Bed Exits.” in proc. of 36th Annual International Conference of the IEEE Eng. in Medicine and Biology Society (EMBC 2014), Chicago, USA, August 2014. B. Wallace, R. Goubran, F. Knoefel. “Measurement of Signal Use and Vehicle Turns as Indication of Driver Cognition.” in proc. of 36th Annual International Conference of the IEEE Eng. in Medicine and Biology Society (EMBC 2014), Chicago, USA, August 2014, pp. 3747-3750. S. Bennett, R. Goubran, F. Knoefel, K. Rockwood. “Distinguishing Between Stable and Unstable Sit-To-Stand Transfers Using Pressure Sensors.” in proc. of IEEE International Symposium on Medical Measurements and Applications, Lisbon, Portugal, June 2014, pp. 76-79. T. Grant, V. Joshi, M. Taylor, F. Knoefel, H. Sveistrup, M. Bilodeau, J. Jutai. “Measuring sit-to-stand timing variability over time using under mattress pressure sensor technology.” International Symposium on Medical Measurements and Applications (MeMeA), June 2014. B. Wallace, R. Goubran, F. Knoefel, S. Marshall, M. Porter. “Measuring Variation in Driving Habits Between Drivers” in proc. of IEEE International Symposium on Medical Measurements and Applications, Lisbon, Portugal, June 2014, pp. 29-34. B. Wallace, R. Goubran, F. Knoefel, M. Porter. “Data Analytics – Measuring Habit Variations to Identify Drivers” Carleton IBM Big Data Symposium, Ottawa, April 24, 2014. Award: Bronze Medal Conference Poster. F. Knoefel, R. Goubran, V. Taler, M. Breau, L. Sweet, A. Frank, B. Wallace, A. Shaddy, R. Lopez, C. Lord, M. Donskov. “MCI: Can Decline to Dementia be Monitored and Delayed by Computer-Based Games? “ Bruyère Research Institute, Open House, Ottawa, April 24, 2014. B. Wallace, R. Goubran, F. Knoefel, S. Marshall, M. Porter. “Distinguishing Drivers by Measuring Their Habits. “Bruyère Research Institute, Open House, Ottawa, ON, April 24, 2014. B. Wallace, R. Goubran, F. Knoefel. “Sensor Systems and Data Analytics to Measure Cognitive Ability while Driving.” hSITE Poster Session, Nov 2013. F. Knoefel, A. Remaud, M. Bilodeau, T. Grant, M. Taylor, R. Goubran. “Unobtrusive movements seen in Geriatric Day Hospital out-patients?” (Abstract) Canadian Association on Gerontology Conference, Halifax, NS, October 2013, pp. 33-34. S.L. Bennett, R. Goubran, K. Rockwood, F. Knoefel. “Automated assessment of mobility in bedridden patients.” In proc. of International Conference of the IEEE Engineering in Medicine and Biology Society (EMBC13), Osaka, Japan, July 2013, pp.4271-4274. S.L. Bennett, R. Goubran, K. Rockwood, F. Knoefel. “Monitoring the Relief of Pressure Points for Pressure Ulcer Prevention: A Subject Dependent Approach.” In proc. of IEEE International Workshop on Medical Measurements and Applications, Gatineau, QC, May 2013, pp. 135-138. B. Wallace, R. Goubran, F. Knoefel. “Cognitive Change Measurement Through Driving Navigation Ability Sensing and Analysis.” In proc. of IEEE International Symposium on Medical Measurements and Applications, Gatineau, QC, May 2013, pp. 164-169. B. Wallace, R. Goubran, F. Knoefel. “Measurement of Driving Routes and Correlation to Optimal Navigation Paths.“in Proc. IEEE International Instrumentation and Measurement Technology Conference (I2MTC), Minneapolis, MN, USA, May 2013, pp. 1465-1471. F. Knoefel, M. Taylor, T. Grant, S. Rocan, J. Jutai, H. Sveistrup, R. Goubran, J. Taylor, M. Bilodeau. 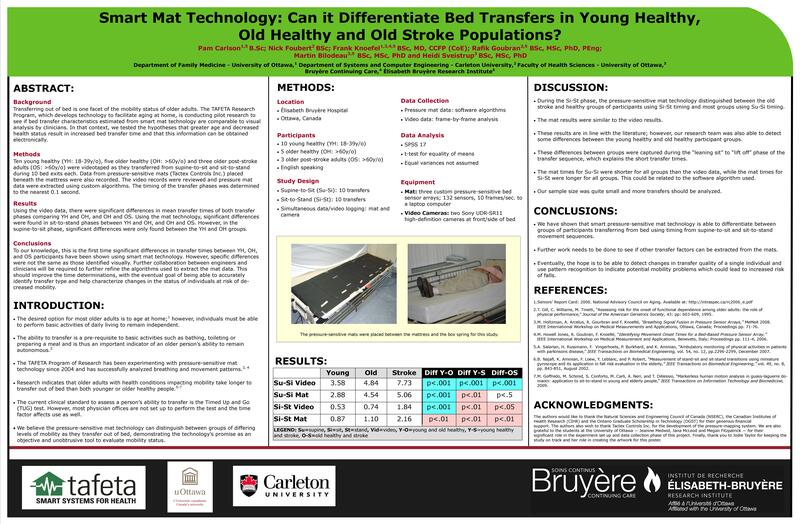 “The Use of a Pressure-sensitive Mat to Monitor Bed Transfer Changes in an Older Adult (Poster).” Current Concepts in Balance, Fitness and Mobility: Perspectives on Intensity in Rehabilitation (UToronto). Toronto, ON, January 2013. M. Holtzman, F. Knoefel, J. Pereira, R. Goubran, C. Barnes. “Unobtrusive monitoring of Respiratory Variability in Palliative Care: A Small Case Series.” International Congress on Palliative Care, Montreal, QC, October 2012. F. Knoefel, M. Taylor, T. Grant, S. Rocan, J. Jutai, H. Sveistrup, R. Goubran, J. Taylor, M. Bilodeau. 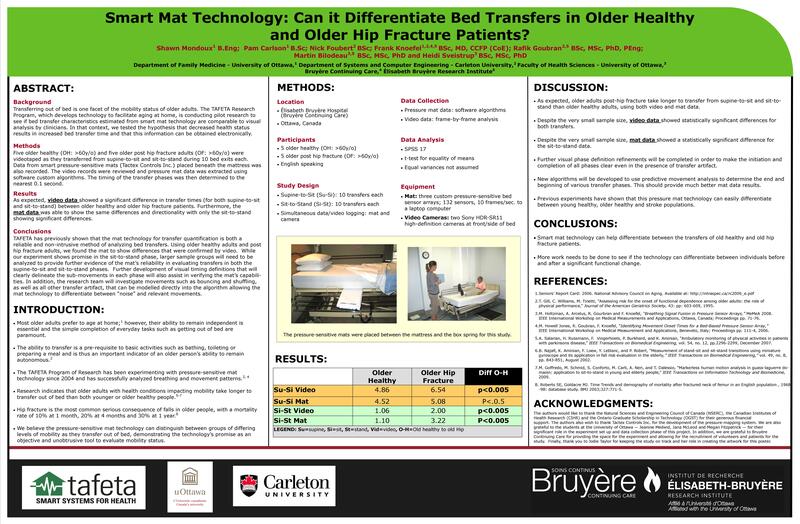 “The Use of a Pressure-sensitive Mat to Monitor Bed Transfer Changes in an Older Adult (Poster).” Regional Geriatric Program of Eastern Ontario, Annual Meeting, Ottawa, ON, October 2012. M. Pouliot, F. Knoefel, R. Goubran. “Improving Nocturia Follow-up Using a Home Bed Occupancy Sensor.” Canadian Association on Gerontology Annual Scientific Conference, 41st Annual Scientific and Educational Meeting, Vancouver, Canada, Oct. 2012.Vancouver, BC, October 2012. M. Pouliot, V. Joshi, R. Goubran, F. Knoefel, “Bed Occupancy Monitoring: Data Processing and Clinician User Interface Design,” in Proc. International Conference of the IEEE Engineering in Medicine and Biology Society (EMBC12), San Diego, CA, Sep. 2012, pp. 5810 – 5814. D. Townsend, R. Goubran, F. Knoefel. J. Leech. “Validation of Unobtrusive Pressure Sensor Array for Central Sleep Apnea Screening.“ IEEE Transactions on Instrumentation and Measurement, July 2012, vol. 61, no. 7, pp. 1857-1865. S.L. Bennett, A. Arcelus, R. Goubran, K. Rockwood, F. Knoefel. “Pressure Signal Feature Extraction for the Differentiation of Clinical Mobility Assessments.“ In proc. of IEEE International Symposium on Medical Measurements and Applications, Budapest, Hungary, May 2012. M. Holtzman, R. Goubran, F. Knoefel, J. Pereira. “Measurement of Respiratory Changes in Palliative Care.“ In proc. of IEEE International Instrumentation and Measurement Technology Conference, Graz, Austria, May 2012, pp. 1472-1476. F. Knoefel, L. Patrick, R. Goubran, and J. Taylor. “Dual-Stiffness: Does it Reduce Fracture Rates Among Older Fallers.“ American Geriatric Society (AGS) Conference, Seattle, Washington, May 3, 2012. M. Pouliot, V. Joshi, J. Chauvin, R. Goubran, F. Knoefel. “Differentiating Assisted and Unassisted Bed Exits using Ultrasonic Sensor.” In proc. of IEEE International Instrumentation and Measurement Technology Conference, Graz, Austria, May 2012. pp. 1104 – 1108. M. Taylor, R. Goubran, F. Knoefel. “Patient Standing Stability Measurements using Pressure Sensitive Floor Sensors.” In proc. of IEEE International Instrumentation and Measurement Technology Conference, Graz, Austria, May 2012, pp. 1275 – 1279. D. Townsend, R. Goubran, F. Knoefel. “Time Domain Characterization of Window Length and Type on Moving Variance Signal Features.” In proc. of IEEE International Symposium on Medical Measurements and Applications, Budapest, Hungary, May 2012. M. Taylor, D. McEwen, R. Goubran, F. Knoefel, H. Sveistrup, M. Bilodeau, “Assessing Standing Stability of Elderly Patients using Pressure Sensitive Arrays,” in Proc. IEEE International Symposium on Medical Measurements and Applications, Budapest, Hungary, May 2012. N. Foubert, A. McKee, R. Goubran, F. Knoefel, “Lying and Sitting Posture Recognition and Transition Detection Using a Pressure Sensor Array,” in Proc. IEEE International Symposium on Medical Measurements and Applications, Budapest, Hungary, May 2012. D. Townsend, M. Holzman, R. Goubran, M. Frize, F. Knoefel. “Relative Thresholding with Under Mattress Pressure Sensors to Detect Central Apnea.” IEEE Transactions on Instrumentation and Measurement, vol . 60, no. 10, October 2011, pp. 3281-3289. M. Holtzman, D. Townsend, R. Goubran, F. Knoefel. “Breathing Sensor Selection During Movement.” In proc. of International Conference of the IEEE Engineering in Medicine and Biology (EMBC11), Boston, MA, U.S.A., September 2011, pp. 381-384. A. Arcelus, I. Veledar, R. Goubran, F. Knoefel, H. Sveistrup, M. Bilodeau. “Measurements of Sit-to-Stand Timing and Symmetry from Bed Pressure Sensors.” IEEE Transactions on Instrumentation and Measurement, May 2011, Vol. 60, Issue 5. pp. 1732-1740. A. Arcelus, R. Goubran, F. Knoefel, H. Sveistrup, M. Bilodeau. “Detection of Bouncing During Sit to-stand Transfers with Sequential Pressure Images.” IEEE International Symposium on Medical Measurements and Applications, Bari, Italy, May 2011. Vol. 60. Issue 5. pp.1732 – 1740. H. Chatrzarrin, A. Arcelus, R. Goubran, F. Knoefel. “Feature Extraction for the Differentiation of Dry and Wet Cough Sounds.” In proc. of IEEE International Symposium on Medical Measurements and Applications, Bari, Italy, May 2011, pp. 162-6. M. Holtzman, R. Goubran, F. Knoefel. “Maximal Ratio Combining for Respiratory Effort Extraction from Pressure Sensor Arrays.” In proc. of IEEE International Symposium on Medical Measurements and Applications, Bari, Italy, May 2011, pp. 88-92. D. Townsend, M. Holzman, R. Goubran, M. Frize, F. Knoefel. “Measurement of Torso Movement With Delay Mapping Using an Unobtrusive Pressure-Sensor Array.“ IEEE Transactions on Instrumentation and Measurement. May 2011. Vol. 60. Issue 5. pp. 1751 – 1760. H. Sveistrup, M. Fitzpatrick, J. MacLeod, O. Habib, A. Arcelus, M. Bilodeau, R. Goubran, F. Knoefel. “Clinical populations can be distinguished on sit-to-stand movement parameters.” Archives of Physical Medicine and Rehabilitation, October 2010, Vol. 91, Issue 10. pp. 5. H. Sveistrup, M. Fitzpatrick, J. MacLeod, O. Habib, A. Arcelus, M. Bilodeau, R. Goubran, F. Knoefel. “Sit-to-stand movement parameters in clinical populations.” presented at the 2010 Annual Congress of Rehabilitation Medicine (ACRM) – American Society of Neurorehabilitation (ASNR) Joint Educational Conference, Montreal, Canada, October 2010. H. Nguyen, D.M. Doran, R. Goubran, S. Doherty, F. Knoefel, A. Tosine, V. Joshi, W. Sun and E. Sadowski. “Integration of Bio-mobility Information with a Point-of-Care decision Support System for Safer Client Care.“ 4th National Community Health Nurses Conference, Toronto, Canada, 16-28 June 2010. A. Arcelus, R. Goubran, F. Knoefel, H. Sveistrup and M. Bilodeau. “Context-aware smart home monitoring through pressure measurement sequences.” In proc. of IEEE International Workshop on Medical Measurements and Applications (MeMeA 2010), Ottawa, Canada, April 2010, pp. 32 – 37. M. Holtzman, D. Townsend, R.Goubran and F. Knoefel. “Validation of pressure sensors for physiological monitoring in home environments.” In proc. of IEEE International Workshop on Medical Measurements and Applications (MeMeA 2010), Ottawa, Canada, April 2010, pp. 38 – 42. D. Townsend, M.Holtzman, R. Goubran and F. Knoefel. “Effect of Windowing on Central Apnea Detection.” In proc. of IEEE International Workshop on Medical Measurements and Applications (MeMeA 2010), Ottawa, Canada. April 2010, pp. 117 – 120. D. Townsend, R. Goubran, M. Frize, F. Knoefel. “Measuring Chest Movement with an Array of Unobtrusive Pressure Sensors.” In proc. of IEEE International Instrumentation and Measurement Technology Conference (I2MTC), Austin Texas, May 2010, pp. 1053 – 1056. I. Veledar, A. Arcelus, R. Goubran, F. Knoefel, H. Sveistrup and M. Bilodeau. “Sit-to-stand Timing Measurements Using Pressure Sensitive Technology.” In Proc. of IEEE International Instrumentation and Measurement Technology Conference (I2MTC 2010), Austin, Texas, USA, May 2010, pp.1337 – 1340. D. Blaney, D. Cloutier, K. Irvine, K. Jensen, A. Arcelus, F. Knoefel, R. Goubran, H. Sveistrup, M. Bilodeau. 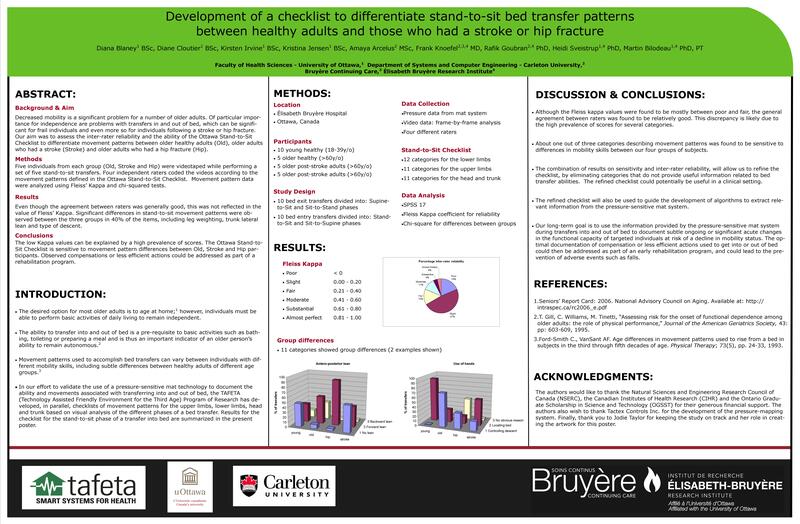 “Development of a checklist to differentiate stand-to-sit bed transfer patterns between healthy older adults and those who had a stroke or hip fracture.” Canadian Geriatrics Society Annual General Meeting, Ottawa, Canada, April 2010. M. Kennedy, A. Arcelus, P. Guitard, R. Goubran, F. Knoefel and H. Sveistrup. “Using a Commode Changes How Older Adults, Adults Post-Stroke and Adults Post-Hip Fracture Sit and Stand from a Toilet.” Canadian Geriatrics Society Annual General Meeting, Ottawa, Canada, April 2010. J. Medwid, O. Habib, A. Arcelus, M. Bilodeau, F. Knoefel, R. Goubran and H. Sveistrup. 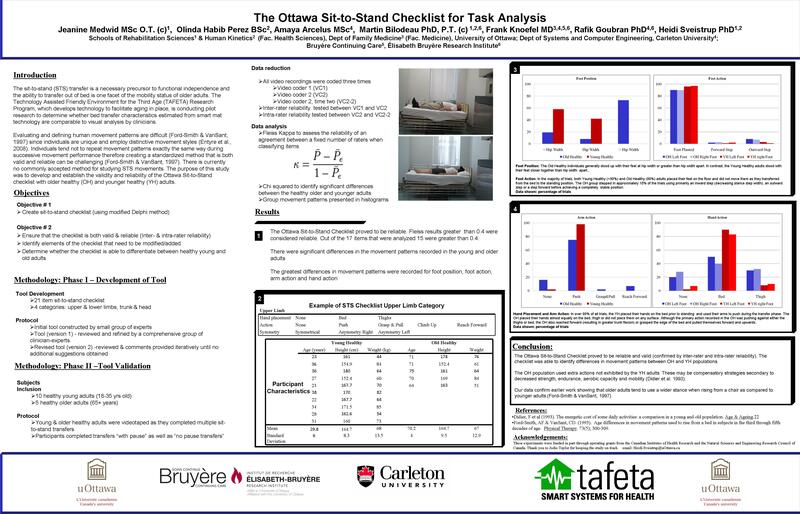 “The Ottawa Sit-to-Stand Checklist for Task Analysis.” Canadian Geriatrics Society Annual General Meeting, Ottawa, Canada, April 2010. W. Sun, H. Nguyen, D.M. Doran, R. Goubran, S. Doherty, F. Knoefel, A. Tosine, V. Joshi, and E. Sadowski. “Integration of Bio-mobility Information with a Point-of-Care Decision Support System for Safer Client Care.” Sigma Theta Tau 23rd Annual Research Conference: Promoting Excellence in Nursing Practice Through Research, London, Canada, 30 April 2010. F. Knoefel, A. Arcelus, R. Goubran, M. Bilodeau, H. Sveistrup. “Can a mat sensor algorithm identify mobility challenges in older adults getting out of bed?” Gerontechnology 2010; 9(2): 225. W. Sun, H. Nguyen, D.M. Doran, R. Goubran, S. Doherty, F. Knoefel, A. Tosine, V. Joshi, and E. Sadowski. “Integration of Bio-mobility Information with a Point-of-Care Decision Support System for Safer Client Care.” Canadian Nursing Informatics Association, Mississauga, Canada, 22-25 November 2009. A. Arcelus, C. Herry, R. Goubran, F. Knoefel, H. Sveistrup and M. Bilodeau. “Determination of Sit-to-Stand Transfer Duration Using Bed and Floor Pressure Sequences.” In IEEE Transactions on Biomedical Engineering. Vol., 56, Issue 10, pp. 2485-2492, October, 2009. M. Townsend, R. Goubran, M. Frize, F. Knoefel. 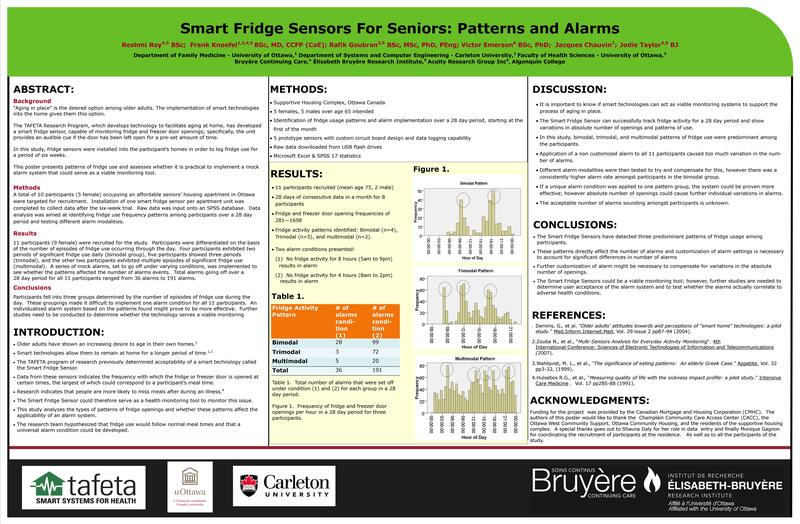 “Preliminary Results on the Effect of Sensor Position on Unobtrusive Rollover Detection for Long-Term Sleep Monitoring in Smart Homes.” In proc. of International Conference of the IEEE Engineering in Medicine and Biology Society, (EMBC’09), Minneapolis, Minnesota, USA, September 2009, pp. 6135-8. A. Arcelus, M. Holtzman, R. Goubran, H. Sveistrup, P. Guitard, F. Knoefel. 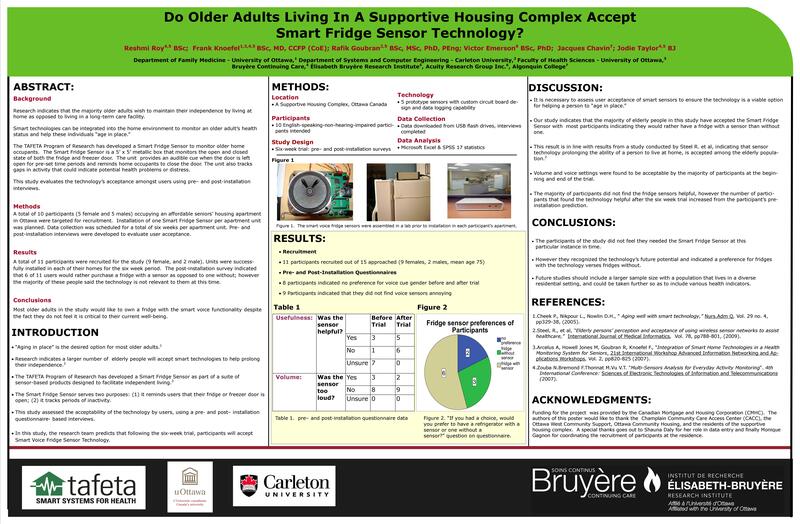 “Analysis of Commode Grab Bar Usage for the Monitoring of Older Adults in the Smart Home Environment.” in Proc. International Conference of the IEEE Engineering in Medicine and Biology Society (EMBC’09), Minneapolis, Minnesota, USA, September 2009. A. Arcelus, M. Holtzman, I. Veledar, R. Goubran, H. Sveistrup, and P. Guitard. “Contact Location Estimation From a Nonlinear Array of Pressure Sensors.” In proc. of IEEE International Instrumentation and Measurement Technology Conference (I2MTC 2008), Victoria, Canada, May 2008, pp. 1969-1973. M. Holtzman, A. Arceuls, R. Goubran and F. Knoefel. “Breathing Signal Fusion in Pressure Sensor Arrays.” In proc. of IEEE International Workshop on Medical Measurements and Applications (MeMeA 2008), Ottawa, Canada, May 2008, pp. 71-76. F. Knoefel, V. Emerson, R. Goubran, M. Bilodeau, J. Morley, and K. Onyett-Jeffries. 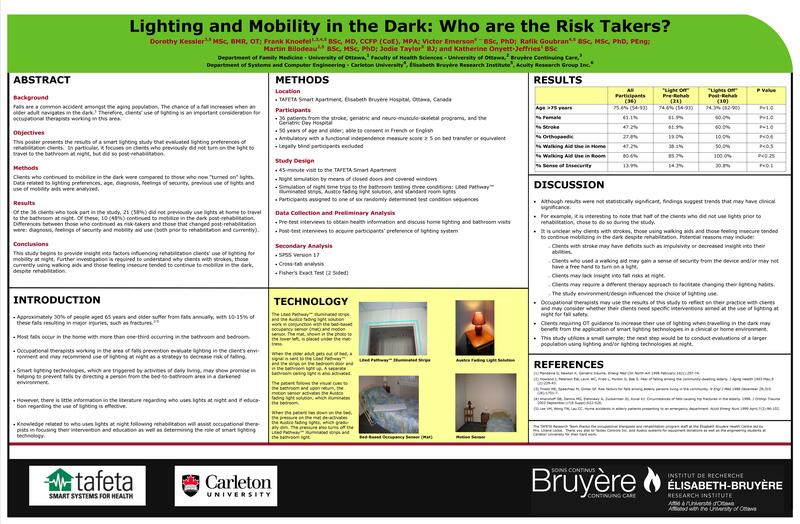 “Do Older Adults Prefer “Smart” Lighting Cues in a Darkened Home Environment?“ Canadian Geriatrics Society Annual General Meeting, Montreal, Canada, April 2008. F. Knoefel, M. Mousseau, and M. Berry. “Pilot Study to Assess Mobility Safety on a Dual-Stiffness Floor.“ Canadian Journal of Geriatrics, pp. 110-112. Vol. 11, Issue 2, 2008. F. Knoefel, L. Patrick and R. Goubran. 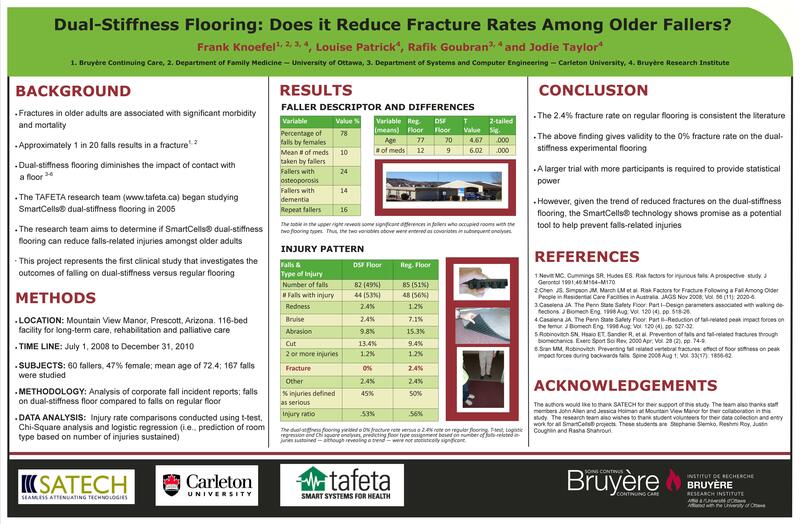 “SmartCells Dual-Stiffness Flooring: Does it Reduce Falls-Related Injuries Among Frail Older Adults?“ Regional Geriatrics Program Annual General Meeting, Ottawa, Canada, October 2007. F. Knoefel, R. Goubran, and M. Howell Jones. “Using a Bed Sensor Array to Monitor Sleep.” Canadian Geriatrics Society Annual Meeting.Banff, Canada, April 2007. M. Howell Jones, R. Goubran, and F. Knoefel. “Reliable Respiratory Rate Estimation From a Bed Pressure Array.” In proc. of International Conference of the IEEE Engineering in Medicine and Biology Society (EMBS’06), New York, USA, September 2006. M. Howell Jones, F. Knoefel and R. Goubran. “Identifying Movement Onset Times for a Bed-Based Pressure Sensor Array.” In proc. of IEEE International Workshop on Medical Measurements and Applications (MeMeA 2006), Benevento, Italy, April 2006.